This creamy, dreamy, lemony cheesecake is dangerously easy and so, so good. 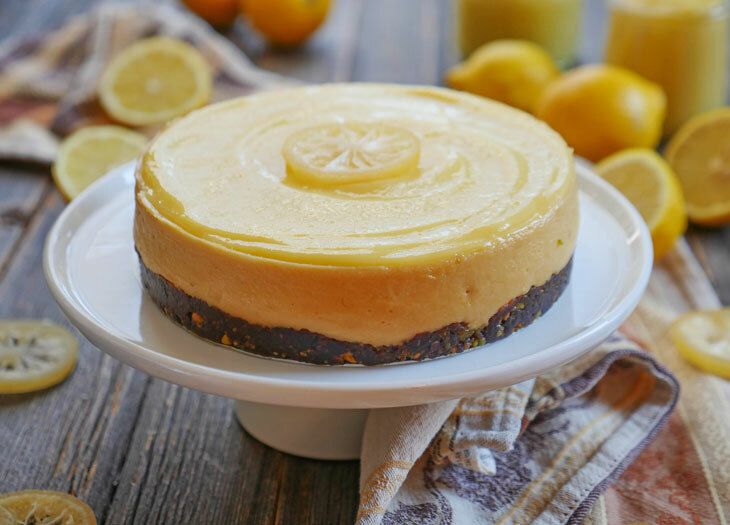 The tart tangy flavor from the lemons perfectly balances out the sweetness from the cheesecake. 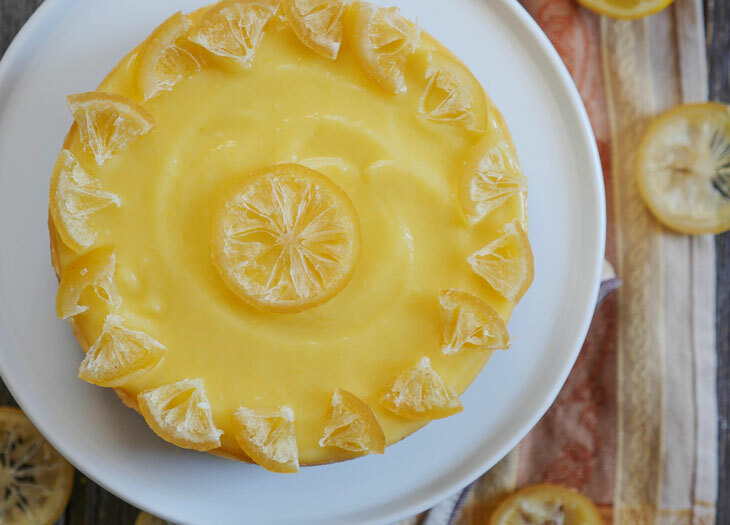 If you love lemon desserts, you are going to love this version of my 2-ingredient cheesecake! 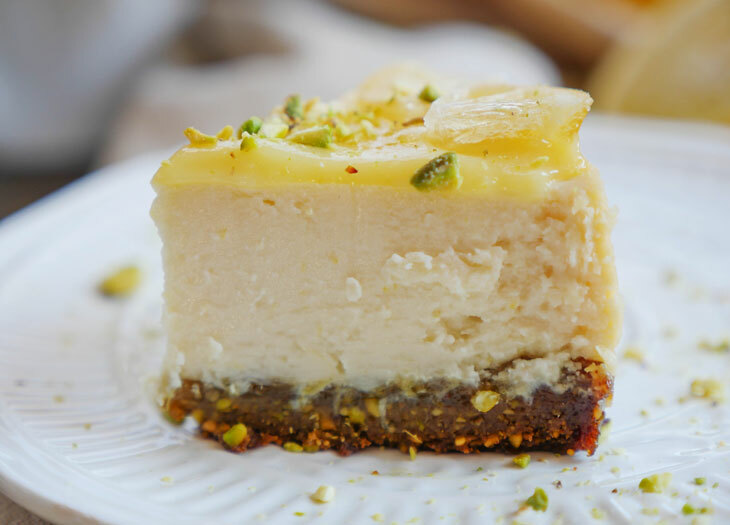 If you’ve found this recipe before trying my 2-ingredient cheesecake (my take on an Indian dessert) then you might be a bit skeptical – how is it possible for this to taste like cheesecake? Especially when there is no cheese in the recipe? Please just trust me, it does. And besides – what have you got to lose? 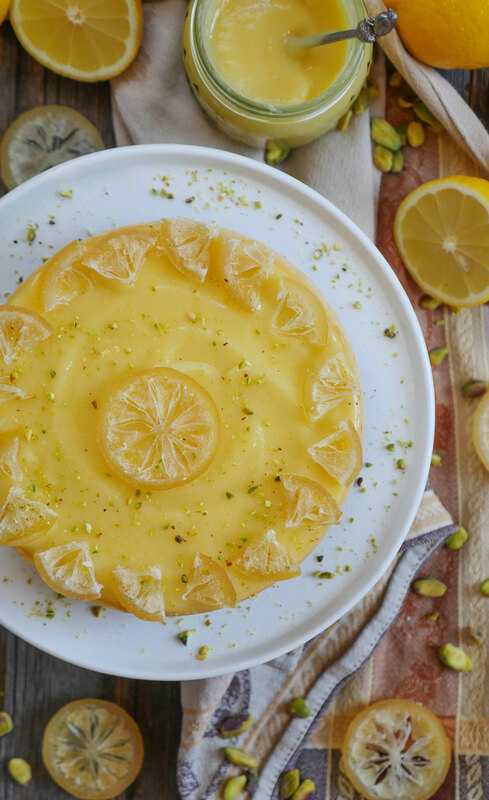 This dessert takes such little prep time and only calls for two necessary ingredients (though if you want it to taste like a lemon cheesecake you’ll need to add lemon juice and zest). And once it’s done, top it with some lemon curd.Totally optional but I love the pop of color that it adds. I also like decorating the cheesecake with candied lemon slices (I buy them from trader joe’s). It’s your call as to whether to add a crust or not. 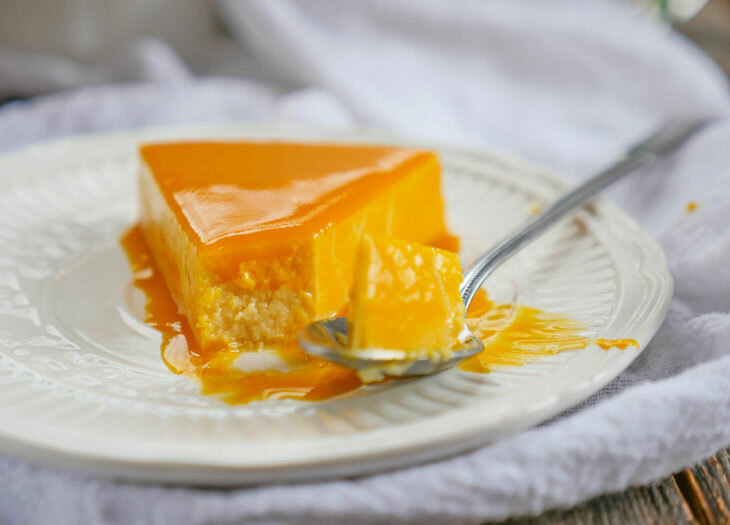 Most of the time I leave my cheesecake crust-less (see my mango cheesecake recipe as an example). This time I decided to make a crust out of pistachios. This nutty crust is super simple – all you need: nuts + medjool dates. That’s my go-to crust when I’m making an easy gluten-free dessert. You can make any type of crust you’d like. I’ve seen blog readers tag me in photos with graham cracker crusts – I may buy some gluten-free graham crackers to try this out myself soon (no patience to make homemade graham crackers these days… #toddlermama). I bet that’d be delicious too! You pretty much can’t go wrong with this cake. This is what the cake looks like when you cut into it. Doesn’t it look sooo creamy? I know this is the tiniest piece you guys, but this cheesecake is SO decadent that this is honestly enough. I can’t wait to hear what you think of this cake! To make the crust: add the pistachios and dates to a blender and blend until it turns into a sticky, crumbly mixture. Add this mixture to the greased cheesecake pan and press down to smooth it out. Use a paper towel to blot the crust a bit (this will help ensure that the cheesecake doesn’t end up green like the pistachios). 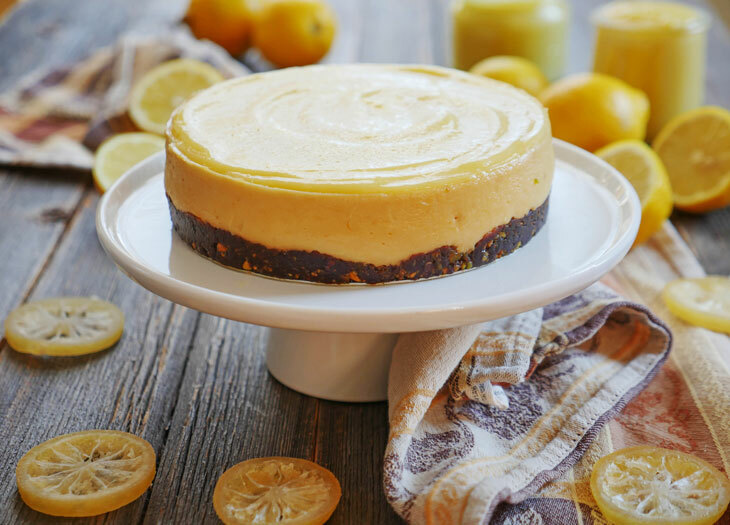 To make the cheesecake: add the condensed milk, yogurt, lemon juice and zest to a bowl and mix well. Pour this into the greased 6-inch cheesecake pan or 7-inch cheesecake pan (with a removeable bottom), then cover the pan with foil. Add 2 cups water into the steel inner pot, then place the trivet/wire rack that came with your pressure cooker into the pot. Place the pan on top of the rack. Secure the lid, close pressure valve and cook for 30 minutes at high pressure. Naturally release pressure for 20 minutes, then release any remaining pressure (do not leave the cheesecake sitting in the pot). The cheesecake should be set – it shouldn’t wiggle. Stick a toothpick into the cheesecake and if it comes out clean, it’s done. If it’s still wet, pressure cook the cake for another 2 minutes. Allow the cheesecake to cool down on a wire rack. I find it easiest to unmold the cheesecake while slightly warm. Put the cheesecake in the fridge to chill for 4-6 hours. This is best when chilled (in my opinion) but you can also eat this warm or at room temperature as a pudding if you like. It will only taste like cheesecake after it has chilled. If you eat it warm, it will taste like custard. You can freeze this cheesecake! It tastes great when thawed but I’ve found they are a bit more crumbly. Still delicious though! 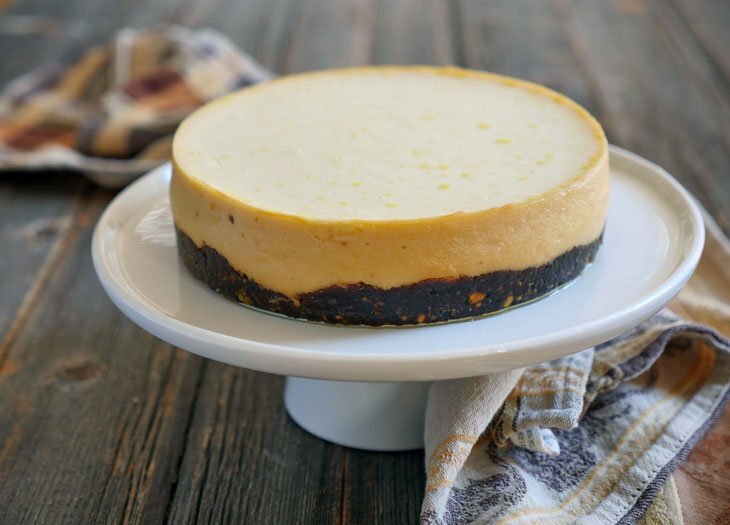 You can also make individual cheesecakes using ramekins – find those directions in this blog post. I made this for dessert last night, and it was great! I was so excited to eat it right out of the instant pot, and it was FANTASTIC! I can’t wait to try it outta the refrigerator this evening! Woot woot! Before your blog, I never knew making cheesecake could be so easy! Thanks Ashley! I was so excited about this – until I saw sweetened. Condensed milk 😝 Thinking of healthier options. This looks amazing, I can’t wait to try it! If you want a quick graham-tasting crust, just mix butter, nut flour and coconut sugar. Perfection! (I often add a bit of vanilla and/or cinnamon, depending on the flavour of the dessert.) But your crust looks delish. Thank you for sharing such a tasty dessert. I made it this weekend , what a surprise, it really does taste like a cheesecake!! And what I really loved was how easy it is to make. What size instant bbn pot do you use for this? I only have the duo mini [3qt). I use a 6 quart but I’m sure it’ll work in the 3 quart if you use the ramekins since they are smaller. Just a question: how many people will this serve? How long will it last in fridge before eating, I want I make two days in advance. Oh my dog, this is fabulous! I just made this at noon and took a taste test at two p.m.! I made mine with lime and my yogurt made in my instant pot too! 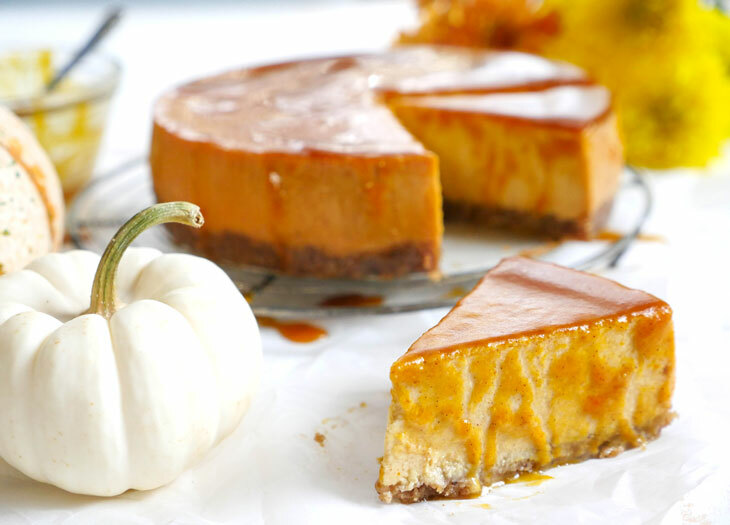 Thank you for the easy and delicious way to get a tasty “cheesecake”! Karen, I’m so happy to hear that!! Thank you for letting me know how it turned out for you 🙂 Lime cheesecake sounds delicious! !